Russia-backed militants made 20 precision attacks on Ukrainian troops’ positions over the last day. They fired a total of eight 122-mm artillery shells, over thirty 120-mm and eighty-five 82-mm mortar rounds, reported Ukrainian Ministry of Defense spokesman on ATO Colonel Dmytro Hutsulyak at a press briefing at Ukraine Crisis Media Center. In Luhansk sector, Ukrainian troops recorded 14 hostile attacks. At about 01:00, Russian proxies fired eight 122-mm artillery rounds in Troitske area. Starting 07:30, militants were for two and a half hours actively shelling the said Ukrainian positions with 82-mm and 120-mm mortars, as well as IFV, mounted weapons. Militants attacked Ukrainian troops’ positions near Novooleksandrivka, Katerynivka, and Krymske several times using 82-mm mortars. “Russia-backed militants were also using grenade launchers, heavy machine guns, and other infantry weapons. They also made attacks on Ukrainian troops deployed in Luhanske, Zaitseve, Zalizne, Novoluhanske, and Maiorsk areas, in the latter the attack involved a ZU-23-2 antiaircraft mount,” the ATO spokesperson added. In Donetsk sector, Russian proxies made six precision attacks. Between 15:30 and midnight they used 82-mm and 120-mm mortars as well as grenade launchers several times outside Vodiane. Ukrainian troops’ positions also came under fire of hostile 82-mm mortars near Lebedynske. Near Avdiivka the enemy used small arms. Ukrainian troops returned fire nine times using infantry weapons. 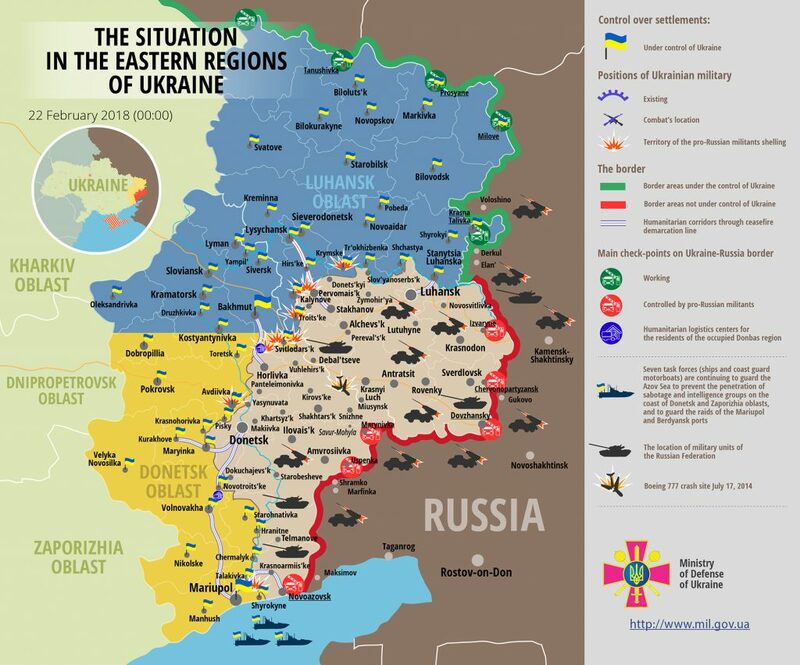 Unfortunately, three Ukrainian troops were wounded in action, one more serviceman incurred a combat injury. Moreover, one Ukrainian serviceman was killed as a result of inappropriate handling of weapons. Report on the military developments as of February 21 is available here. Interactive data on the shelling: chronology shelling chart and the interactive map.